Today I am sharing with you a little Christmas Treat. 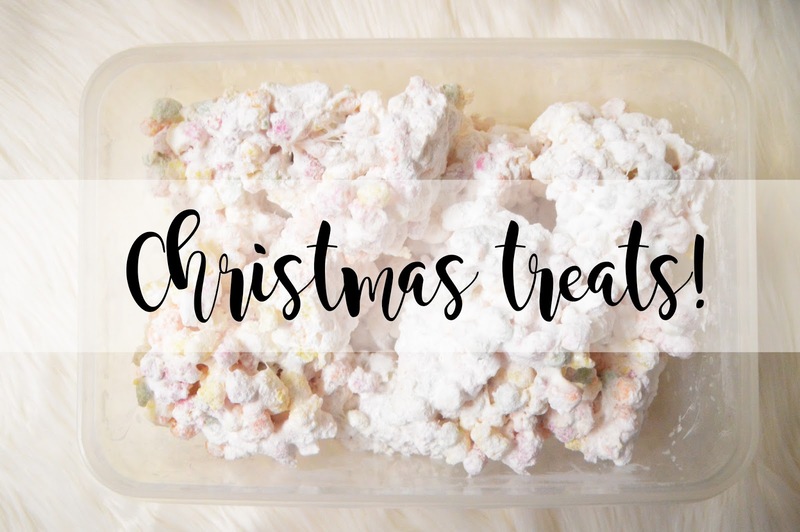 This was originally supposed to be a full blown Christmas Baking post however I have been ill since Friday so I haven't been able to bake (I don't want to make everyone else ill) so I thought I thought these yummy marshmallow, rainbow chunks would be perfect as a Christmas treat and they're easy to make too! (I say easy, I actually sprained my wrist making these). Melt the marshmallow either over the hob or in the microwave. To make this step easier you can add a little bit of butter as stirring it without butter it so hard as the marshmallow goes sticky and stringy and impossible to stir. Once the marshmallow has melted you want to quickly pour in the rainbow drops and stir these in so they are evenly distributed into the marshmallow. Line a baking tin with parchment paper and pour the mixture into the tin, evenly distributing it. This is also another difficult task! Leave to set at room temperature and then tare or cut into pieces. I really enjoying taring these as I found it impossible to cut them. You then want to roll them in Icing Sugar so they are no longer sticky. Let me know if you end up making these, I'd love to know! They are a fairly easy treat to make and I'm sure children will absolutely love them! However they are very sweet and obviously bad for your teeth too, but who cares! Oh my goodness these looks so delicious! Those looks SO delicious. I need to try them.